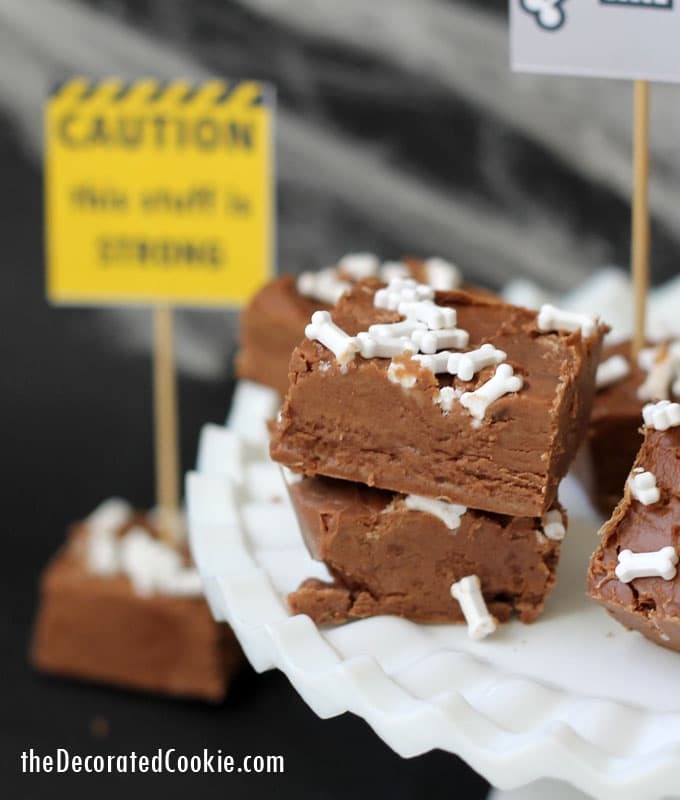 Three-ingredient boozy Halloween fudge is all you need for a grown-up Halloween treat. I even included some free printables. It’s baaaaaaack. My boozy fudge, that is. 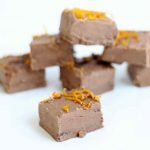 It’s been awhile since I mixed up some of my boozy fudge, also known as the best adult dessert ever. Three ingredients, ready in minutes, filled with chocolate and booze. 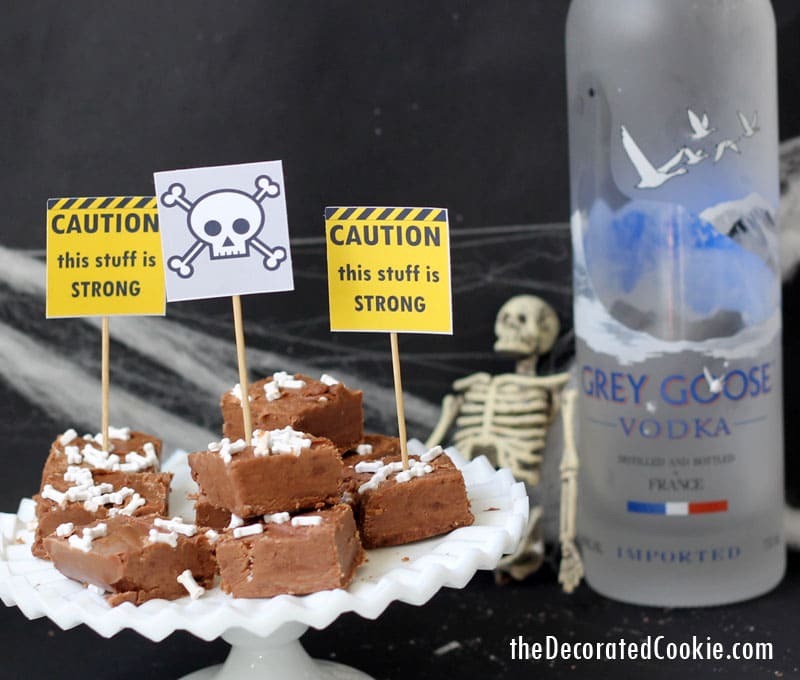 I could cry at the awesomeness of this boozy Halloween fudge. 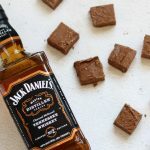 To make boozy fudge, you need a package of chocolate chips, a couple pounds of confectioner’s sugar and a cup of booze. So far I’ve tried whiskey, gin, tequila, vodka, rum and Bailey’s. My favorite is gin, but it’s a close call with the others. If you like, you can add a fourth ingredient to sprinkle on top, such as orange or lime zest. 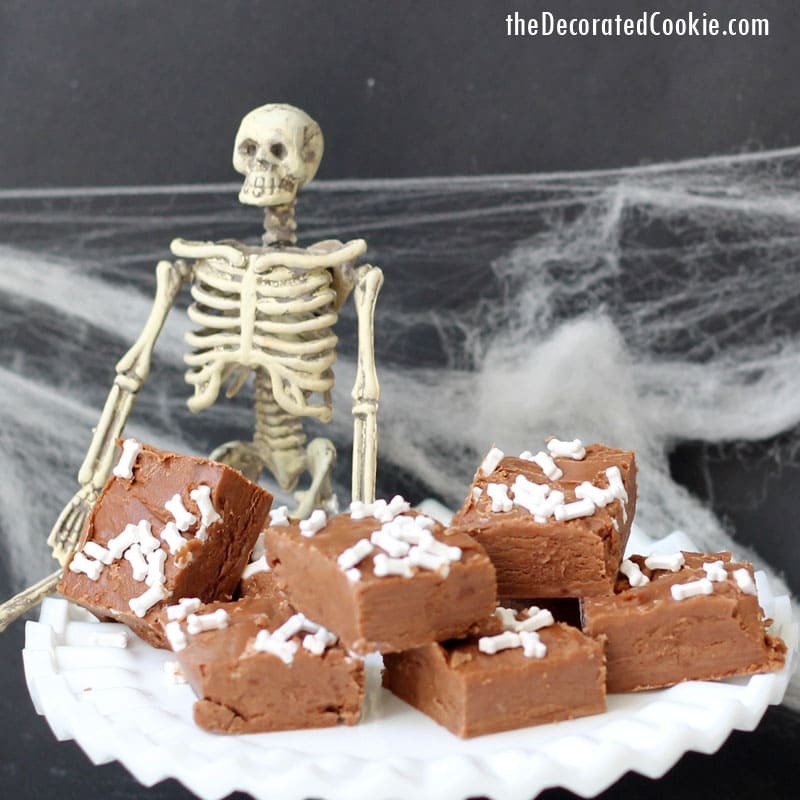 To make this fudge perfect for Halloween, I’m adding Bones sprinkles, but that is optional. And the liquor I chose for this one? VODKA. And you know what else I did for you all because I love you so much? 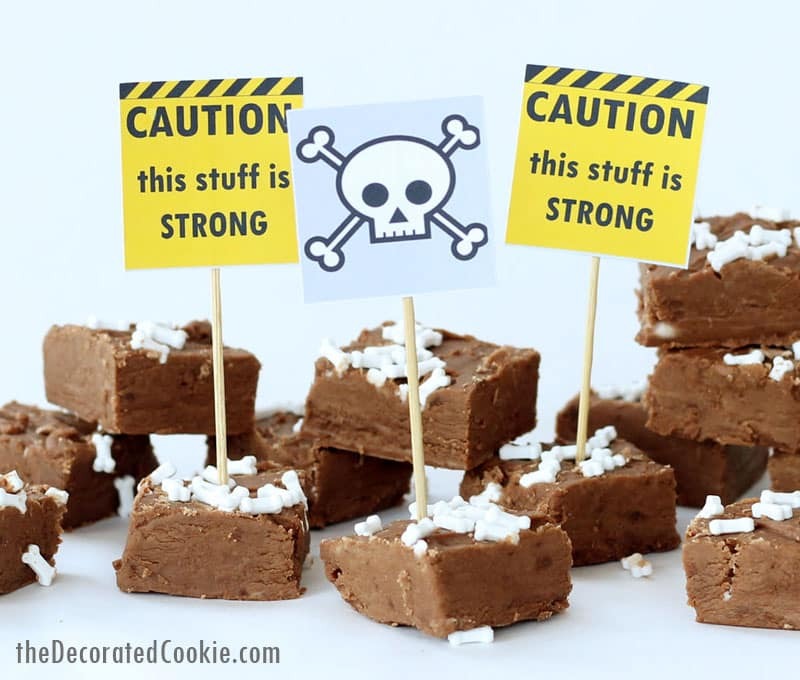 Made these free Halloween printables Just cut out and tape to 4-inch skewers and insert into the finished fudge. Oh no, this guy had too much. When the chocolate is melted, quickly pour the chocolate into the sugar and vodka mixture and stir very well. Scrape the chocolate, vodka and sugar mixture into the prepared baking pan. Spread evenly. 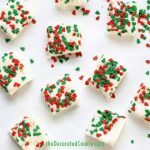 If using, immediately sprinkle sprinkles on top and gently press into the fudge. Let the fudge set at room temperature just until firm, about 30 minutes. Lift from the pan and cut into squares. Let set fully for another hour. 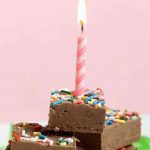 If the fudge is still too soft, place in the refrigerator to firm. 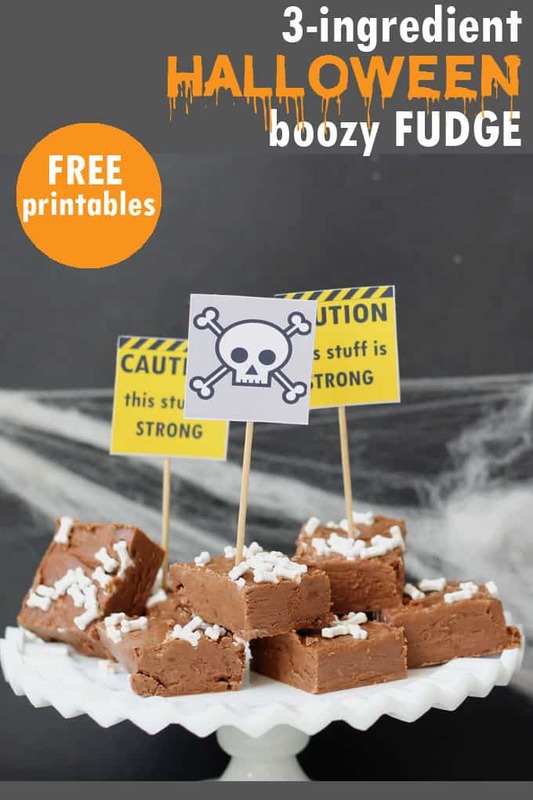 To add toppers, print out THIS HALLOWEEN PRINTABLE, cut out the squares, tape to 4-inch skewers and insert into fudge.